Eighty-four American Flag cigar 'flannels' (also called 'blankets) make a unique quilt of 'pop art'-type imagery because it repeated the same iconic motif across the quilt surface. The flannels were printed in various series for people to collect and remember their brand, as well as to protect and cushion cigars when cedar box packaging was first introduced. 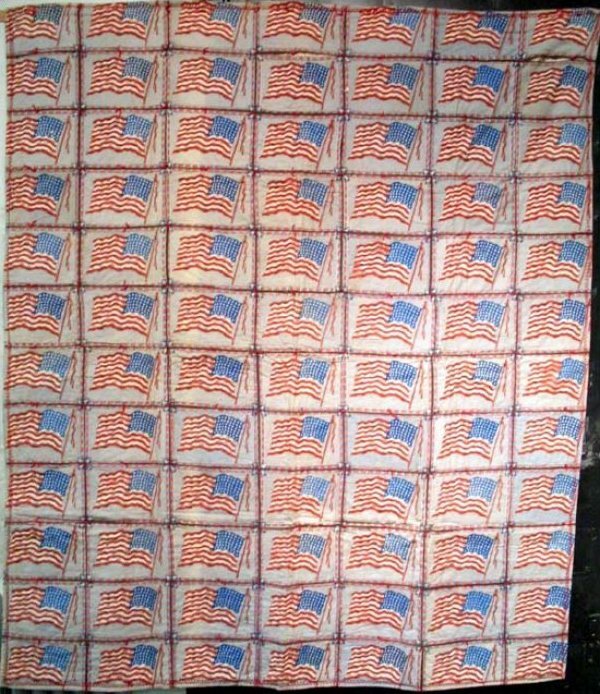 Most cigar flannel quilts are random assortments made with a variety of international flags or other motifs produced by the manufacturer; this example demonstrates either brand loyalty or diligent collecting. Graphic and historic.